Cosplay group Star Wars Steampunk Universe shares their inspiring story and why cosplayers should make films using their smartphone cameras...but wait...there are many fun moments worth a listen too! CK Goldiing made an inspiring film in the UK and he shares his experience making the film using his smartphone. This episode is lots of fun and has many fun moments. International Mobile Film Festival 2018 was a blast. You will hear it in their voices as the filmmakers and some sponsors take part in a roundtable discussion about their experience in this podcast. Oh, but wait...there soon appears a lot of teasing between the participating filmmakers and two winners who both happen to be from Australia. One winner used an Android smartphone and the other used the IOS iPhone. This one will have you laughing and inspire you at the same time. We needed to share the opportunities available to anyone who is working on their brand using video because we don’t want you to feel left out or like you need to put video out there to promote yourself when you are not comfortable with it. You may be a solopreneur, a small business owner or you may be a professional working on personal branding or your image. We interviewed Francesca Jago, founder of Get Ahead Media in Wellington, New Zealand back in episode 13 of the SBP Podcast. That was ten episodes ago and you won’t believe how far she’s brought her company since then. 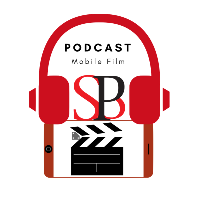 The best part is that she has developed an opportunity for you to benefit from it!SBP Podcast is The Voice of Mobile Film™ and Episode 23 is giving a voice to Get Ahead Media in order to help you give your business a voice using smartphone video, as a professional.You will realize that the courses and tutorials Get Ahead Media is providing users are three dimensional due to the way in which she is providing the opportunity for you to benefit locally and online. Listen to the podcast to learn great insights into smartphone video production and see if you are a good fit to sign up. Just as our podcasts focus on providing you with information and tips you can use, we discuss some resources you can put to practice right now. During our Patreon Bonus Podcast, as a patron, Francesca shares tips on creating video tutorials for your business. If you like our podcasts, we hope you will subscribe and share them with your network and friends! You can listen on iTunes, GooglePlay, Stitcher and many other platforms whether you are working out or in your car. Watch this short video from Francesca Jago on Smartphone Video for Businesses and brands: https://youtu.be/ZJaI5B7PPy0Link Francesca shared during her podcast:5-day Challenge https://getaheadmedia.lpages.co/5-day-smartphone-video-challenge/Follow Francesca Jago with Get Ahead Media:Facebook: https://www.facebook.com/getaheadmediaTwitter: https://twitter.com/getaheadmediaInstagram: https://www.instagram.com/getaheadmedia/YouTube: https://www.youtube.com/channel/UChzI-mllAPBDw4FveJfIALinkedIn: www.linkedin.com/in/francescajago/SBP Podcast: The Voice of Mobile Film™ is for everyone who ever wanted to or is curious about making movies and videos using smartphones.SBP Links:Patron Subscriber Bonus Podcast Episode:https://www.patreon.com/posts/17807037Patreon for SBP Podcast:http://patreon.com/sbppodcastSBP Podcast Blog:http://sbppodcast.wordpress.comSBP Podcast Website: http://sbppodcast.studioInternational Mobile Film Festival Website:http://internationalmobilefilmfestival.comFacebook:http://facebook.com/sbppodcastTwitter:http://twitter.com/sbppodcastSusy Botello on Twitter:http://twitter.com/susybotello© copyright 2018 S. Botello Productions™. All rights reserved. You need to take your business seriously and today, you need to brand your business to stand out. The most successful branding tool is video and we discuss smartphone video for your business branding. However, there is a lot of fun in this discussion. Learn and have fun-- and enjoy a few laughs too!